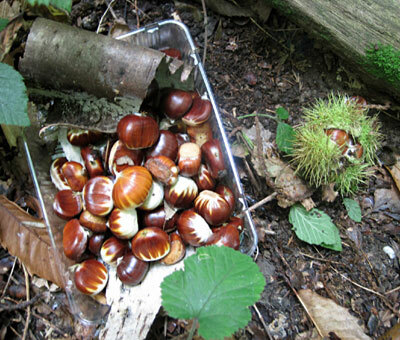 During a walk around a local wood, I noticed the ground was littered with thousands of ripe chestnuts – while I picked some of those (extricating them from their spikey cases with the toe of my boot) more were falling out of the trees; luckily none hit me – I imagine it would have hurt! It makes me wonder how people would have extracted the nuts thousands of years ago when most folk would presumably have been barefoot or wearing soft moccasins – maybe they just squashed the cases with a log then picked out the nuts? It was interesting trying to notice clues as to which husks held the best nuts. Obviously some of them were bigger, but I found the best way to tell was to look at the back. Where the nuts had grown to a fairly good size there was a cross of un-spikey husk showing – some of these held 2 or 3 good sized nuts. The other clue was to avoid husks that were browner in colour, as these had mostly fallen before the nuts were ripe or had already been raided (and rejected) by squirrels; I concentrated instead on husks that were still light green. Some of the nuts contained little worms although no holes were visible on the shells – I expect their eggs were laid before the fruits formed and the holes are made as the mature insect burrows out. The main indication of bugs inside was that the shells were shrivelled, usually around the top of the nut. 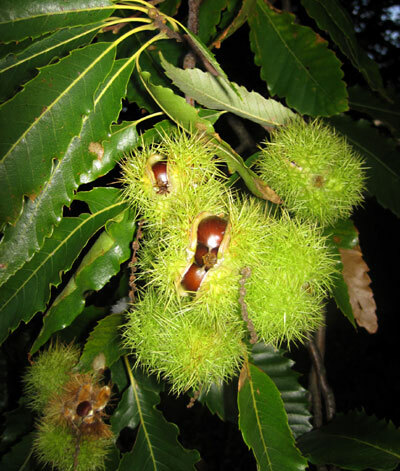 Some trees seemed much more affected than others, so if you’re out foraging and are finding a large proportion of buggy chestnuts, it may be worth moving to a different tree. Some trees were much more productive than others, with most cases containing 3 huge chestnuts, wheras on some trees nearly all the nuts were shriveled or full of bugs! The other innovation was that it was far more efficient to kick several into a pile (preferably on the hard surface of the path!) and squash them at the same time – I wonder if in the past it could have been a group activity, with everyone joining in – especially if it was a case of beating not only the ever present squirrels and other rodents, but presumably wild boar! 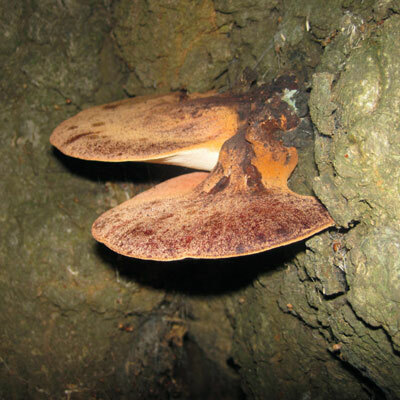 The other picture is beefsteak fungus – edible, grows on oak, turns the wood a rich dark colour – furniture makers love it! Very tasty, but can be bitter – soaking overnight in milk or water helps. Does not taste like steak unfortunately! This entry was posted in The Woodlore Team on December 8, 2011 by Woodlore Team. Getting even more excited! Very eager to attend Introduction to Bushcraft. It’s amazing the amount of food you can forge and things you can do in the UK woodlands. Thanks Sarah for sharing an interesting and informative message,also in response to Kai’s question, I’ve found that making a ‘x’ shape cut (carefully) with a knife in the top of the nut to reduce the risk of them exploding on the fire, drop them in glowing embers, scraped from the heart of the camp-fire to the outside (not too far) a few small twigs to create flame placed over the nuts and embers bring out the best flavour in them (much better than a conventional oven, gas or electric, and more eco-friendly also) I also find that letting them get slightly charred is best (personally). You can scrape them out with a green stick to cool down for a couple of minutes (the green leaves of the tree make an excellent ‘plate’) when cooled, they are easier to peel and eat, the sweet chestnuts/trees (Castanea sativa) were first introduced to Britain by the Romans, anyway; enjoy!!! Yeah, thanks a lot! Some very interesting tips. It really is very enjoyable speculating about how general tasks where figured out by our ancestors, isn’t it? I think that this post also illustrates how in Bushcraft one has to constantly be making decisions and how it pays to put a little bit of thought into everything we do. It would be all too easy to just pick up the first nuts that we see, but that wouldn’t necessarily be the most productive way of going about it! Any tips for roasting them on “An open fire”?